Many of us think of February as a time to share our love with the people that matter most in our lives. With Valentines Day here this month, there are plenty of pink and red cards with hearts wherever we look, ads for flower delivery service and great deals on dinners for two. Which don’t get me wrong, is wonderful and sweet, but it’s been my experience that we can sometimes forget THE MOST IMPORTANT relationship in our lives, the one with ourselves. 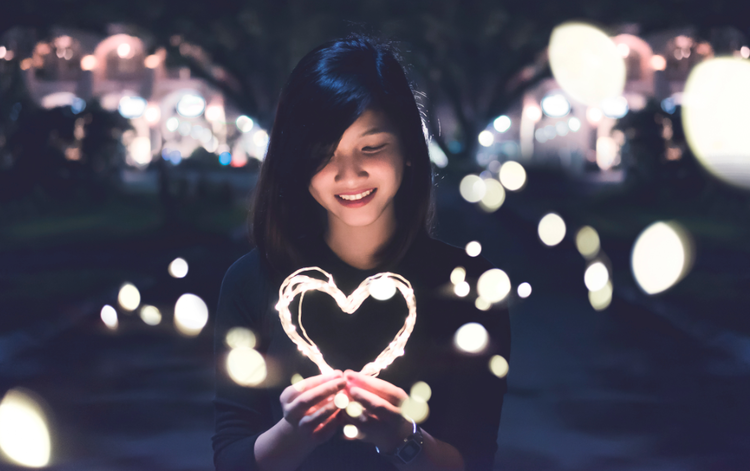 So with that thought in mind, I reflect back on a blog post I wrote in the past called, How Do I Love Me, Let Me Count the Ways. I listed 25 creative and fun ways I share loving kindness with myself. Today I want to focus on three powerful and simple ways we can strengthen our bonds with the person we spend the most time with, ourselves. I choose this one first because how we talk to ourselves matters a lot. We hear what we tell ourselves either consciously or unconsciously for all our waking hours. Through the thoughts we think, the stories we tell ourselves, and the words we choose over and over again, form what we perceive and how we interpret the world around us. I doubt you would criticize a small child for misspelling a word or being afraid of the dark. So why would you do that to yourself? Words carry energy and a vibration, and if everybody knew the incredible power words actually had, they would choose more carefully and vow to never speak another negative word about themselves again. Now that may not be very realistic, but we can start with becoming more aware of our self talk and choose to shift it to the positive more and more. And like any habit or muscle building exercise, the more we do it, the easier it gets. So make the choice one day at a time, to start paying attention to when you’re talking to yourself with negativity, blame or judgment. Ask yourself, is what I’m telling myself really true or even helpful? What can I tell myself that would be more positive, compassionate and kind? Our words are a simple but powerful way to extend and share loving kindness with ourselves. When was the last time you took the day off just to do something you enjoy. It’s easy for many of us to get caught up in completing our TO DO lists and all the things that need to get done each day. Honestly this is one of my challenges and I often need to remind myself to make time for fun. Whether we take a whole day or just an hour, making time for what brings us joy allows us time to live in the moment like we did when we were young. Ask yourself, what are some things I really enjoy doing? Start a list of fun activities, adventures you would like to take, new experiences or things you would like to learn that are purely for the purpose of creating more joy in your life. One of the great gifts of the internet is we can search almost any subject and find activities to do, places to go, and things to learn. You can also remind yourself what you loved to do as a child. The simple pleasures of listening or dancing to music, making art, reading a favorite book, sharing a meal, or spending time in a garden can nourish our souls and renew our energy. This one may seem surprising but it’s a powerful one. Our lives are often filled with so much noise and distraction that we forget to take time to listen to ourselves, to our deepest wishes and heart’s desires. It’s a time to pause, to slow down and give ourselves space to breath and reflect. Starting or ending your day with some quiet time can help center your mind, relax your body and prepare you for whatever is next. It can be a time to ask yourself some simple questions, and listen to your inner wisdom to guide you forward. We all have a deep well of wisdom and intuition that we can access when we give ourselves the time to connect within. Questions like, How can I support myself today? What am I learning or observing about myself? Or, What do I really want? Breath deep, and listen. You can try it now. Take a deep breath, close your eyes, and ask yourself, How would I like to love myself today? Listen, and honor your voice. In the silence, you’ll find your answers. So begin choosing to give yourself the love you deserve. Give yourself the gift of you, in ways that bring you joy and light you up. You are beautiful, powerful and a gift to this world.